I posted earlier about problems with GISS. They have now posted the January anomaly, and it is 0.61°C, up from 0.44°C in December. That's a big rise, but less than the big drop in December. TempLS recorded a similar rise (0.15°C), and I blogged about that and the reasons here. NOAA also rose from 0.42°C to 0.54°C. As usual below the fold I'll show the comaparative spatial distributions. I posted earlier about a delay due to a small hiatus in GHCN data posting. They have posted new data, so I have done the regular January analysis. The temperature anomaly is up to 0.40°C, which is a rise of 0.15°C from the low December value. The satellite indices showed even steeper rises. 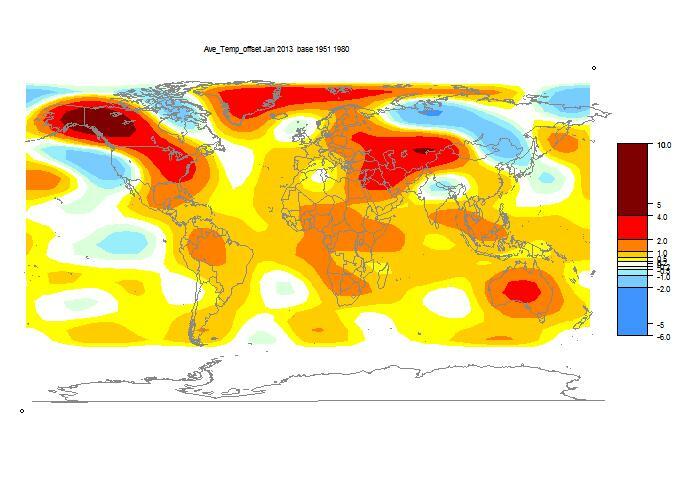 The warm areas in the plot below show up as NW N America (very cold in December), Central Asia, and Australia. 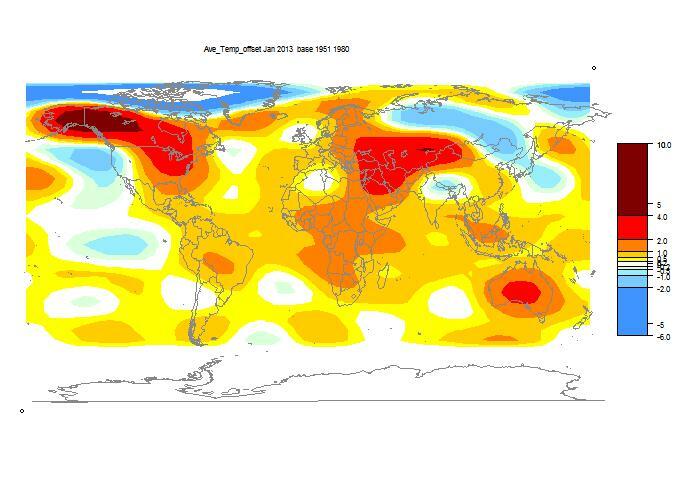 Below is the graph (lat/lon) of temperature distribution for January. I've also included a count and map of the stations that have reported to this date. Recently I posted some screencap videos derived from the WebGL displayed sea surface anomaly temperatures. These excellent data are supplied by NOAA/NCDC, based on their OISST processing of AVHRR satellite data. I have now been able to mechanize the process of production. I no longer use screen grabs, which was a major holdup. So I have now posted a page which has a much greater number of videos installed, covering various regions of interest. Some of these are up to date, and I plan to maintain them so. You should be at any stage able to replay the last 50 days of ENSO, or the last 100 days at 2-day resolution etc. Same for Arctic, Antarctic and N Atlantic. I've tinkered a lot to try to get something working in each browser type. There are various difficulties; IE and Safari support for the HTML5 movie tag is patchy. Currently Firefox and Chrome should see OGG videos with controls, while Safari and IE see .swf videos looping without controls. In both cases you should be able to select. There is now a little string at the bottom of the selection area that you can use to link to your current view. I'll use that in this post. The movie sequences, apart from the ones ending now, are generally full years at 4 day intervals. For ENSO, we currently have 2012,2011,2010,2008,2007,2006,2005,1999 and 1998. For Arctic, 2012,2011,2010,2007 and 2000. Update - as an experiment, I've tried longer, faster sequences. They didn't add to the download time nearly as much as I expected, and the results are very good. Here is 2012 at five days a second. The first notable feature is a large region at zero anomaly. This is ice. It isn't true that all ice is at zero anomaly, but it's mostly true that zero anomaly is ice. You can see the ice melt and refreeze. The melt is streaky because melt ponds etc may report a positive temperature, but the refreeze is clear and dramatic. Here's the 2010 annual movie. You can also see warm SST that may be influencing melting. One thing to watch for recently is the persistence of clear water north of Svalbard, well into the winter. The patterns, Gulf Stream etc are familiar, but show up dramatically here. On a finer scale it is possible to see some effects of hurricanes. I'll show soon a video of the SST footprint of Hurricane Sandy. I've been busy making SST movies. It's automated now, and I can produce lots, and keep them up to date. But showing them can be a nightmare. There are technical issues, but they seem to be mainly commercial or patent. So I've been producing movies in swf, flv, ogg, mp4 and it's still hard to get something that works for everyone. I use Firefox mostly, so I checked that. appCodeName=Mozilla, as expected. appName=Netscape - not so obvious, but I know the history. Then I tried IE. Surprise. appCodeName=Mozilla! But at least appName=Microsoft Internet Explorer. Then I tried Chrome. Worse. appCodeName=Mozilla, appName=Netscape. And Safari the same. So I'm stymied. Navigator will even return a detailed header, but I can't see anything there I can reliably use. There's likely to be more difference between browser versions than browser brands. Anyway I found this amusing account of the history. Update - I think I found a solution. Go with their strength! They don't mind using each other's names. What they won't share is a video format. The new HTML5 video tag allows you to ask whether particular formats are supported. IE 4, FF 3, Safari 4 and Chrome 7. That still leaves IE and Safari. But IE at least uses its own appName. Actually IE is helpful in another way. They are so non-standard that they provide a metalanguage, buried in HTML comments, that allows you to write IE-only blocks of code. I'm late posting on temperature this month. But it isn't for lack of attention. Odd things are happening. GHCN hasn't updated since 5 February. One can get a good estimate on the first few days, but it will be subject to correction when more data comes in. The other oddity is that GISS, which has been having server trouble, won't respond to my script query for the monthly global average. I can see it. And it has updated for December, but not January. My monitoring page doesn't show their December figure. I could intervene manually, but I'm reluctant to. I also don't intervene to manually put in the UAH numbers which Roy Spencer announces - I wait till the script can see them. This follows an earlier post which has .swf movies derived from the HiRes NOAA SST page. This has the WebGL rotatable globe with a shaded 1/4° plot and lots of daily data, courtesy of NOAA/NCDC and partners. I've made some improvements, mainly to aid the showing and making of animations. Although the ordinary videos are easy to start up, I'm hoping to make the WebGL version equally accessible. The resolution is much better, especially with zooming, and, well, it's just fun to be able to rotate the globe while the animation is in progress. So I've added a Pause button and a Step button. I've also systematised the buttons so each has pretty much a toggle function, and turns red when it's on. That helps, because the logic of how they all interact is now complicated, though I hope intuitive. The mode of movie operation is still that you set up a sequence with the Seq button, prescribing step in days and total frames. This was slow at hi-res; it's better now, but too fast at low res. The Pause button will stop this if you change your mind. There's a counter for the frames. Then Cycle with set interval in Secs (can be fraction) will show a proper movie in loop mode. Again Pause will pause it, and while paused, Step will go one frame at a time. I'd recommend that you toggle off any buttons that you don't need. There's an interesting new button that I've called Manual. It's to help with making flash movies. Like other buttons, it turns red when clicked, and in that state, allows control by keystrokes. j sets it to the start of a movie sequence and k steps by one. You can use it in this mode if you like. Note that it works on a focus system, so if you click elsewhere, focus is lost and the button goes pale and doesn't receive keystrokes any more. But the real purpose is to allow another process to take over and synchronise. I mentioned in my last post that I found a nifty program, NirCmd, that will set up a loop that takes screenshots at prescribed intervals. It will also generate keystrokes, so I can ensure that each screenshot is of consecutive frames. You'll notice a new timestamp top left. You can move this anywhere in the plot with a Shift-click. convert *.png -crop 780x4000+30+80 -resize 75%% "w%%02d.jpg"
The arg %1 is the loop counter; the first line forces the WebGL to the first frame, second just ensures that the output will be in alphabet order, then the screen shot, then the signal to step a frame. I've added an animation of 2012 at 4-day steps. There will be more.